The Investor Intelligence Short-Term Composite Indicator has proven to be a valuable tool for short-term market timing ever since it was developed in the 1960s. A reading of over 70 means the general index has become oversold. Below 30, it has become overbought. Three weeks ago, as shown in the chart below, it was at a very oversold 4, a reading that proved to be very accurate considering the subsequent stock market bounce. The recent market bounce has rapidly moved the indicator to overbought levels. 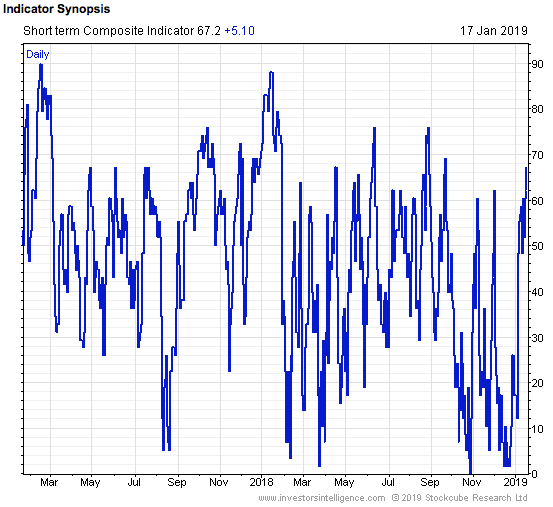 This recent chart shows the indicator at 67.5 level, but it is probably above the oversold 70 reading after a subsequent market bounce. The fast-moving pace of this indicator is another clear warning sign that the market continues to be highly volatile, and very risky. We recommend investors lighten their stock portfolios. We expect more and bigger downward corrections than the one that occurred in the fourth quarter before stocks reach oversold levels that would trigger a durable, longer-term rally.